Agricultural Botany section is actively engaged in undergraduate and postgraduate teaching in addition to conducting research work on rice and soybean. This section is having an area of 1.50 ha. covering Dhanvantari Udyan (Herbal Garden) and Teak plantation. The section is provided with four well equipped laboratories including plant tissue culture laboratory. Seed production programme is also executed as per the university directives by this section. The staff of this section also uses to render services to farming communities. The staff from this section also visiting problematic fields, writing popular articles in newspaper, magazine and attending farmers rallies. 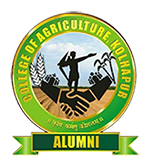 Agricultural Botany section is provided with two Associate Professor and five Asstt. Professor and supporting staff headed by the Professor of Agril Botany. At present one post of Assistant Professors is vacant and one Assistant Professor is on study leave w.e.f. 01/08/2015 for Ph.D. programme. The section use to offer eleven core courses and part of two experiential learning courses as per the revised syllabus in two semesters every year. In addition to teaching, each staff member is allotted ten to fifteen students for counselling. The teaching staffs uses to guide and solve academic as well as personal problems of these students. Staff members are also organizing coaching classes for the students appearing for ICAR Jr. Res. Fellowship Examination and JNAU Examination (PG entrance exams) as well as competitive examinations. The following courses are offered by this department as a core courses and experiential learning courses. B. Sc. (Agri). Course Layout as per IV Dean Committee.